Nothing beats representing your country. 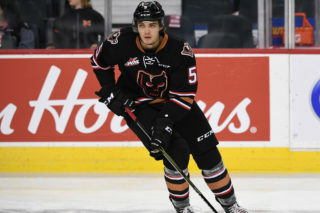 For Hitmen rookie defenceman Luke Prokop, he was able to experience what that was like first hand during the World U-17 Hockey Challenge playing with Canada White. It was a moment he’ll never forget. “It was a really cool experience,” he said. “Whenever you get to represent your country it’s an honour and it was a surreal moment putting on the jersey. 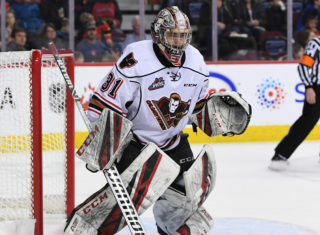 Prior to the tournament, Prokop was one of 111 players who were invited to the U17 summer camp that determined who would make the three Canadian rosters. 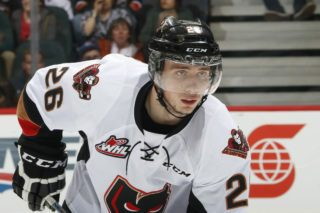 The Edmonton native had a strong showing, impressing the coaches and scouts and earning him a spot. “I was nervous waiting for the call, it was an anxious time,” Prokop said. “Once I got that phone call from the head scout telling me that I made it, I ran upstairs to tell my family about it and they were all so happy and proud of me. Fast-forward to when the tournament started on Nov. 4 and his confidence was evident in his play. Not to mention the added bonus of being named an assistant captain. 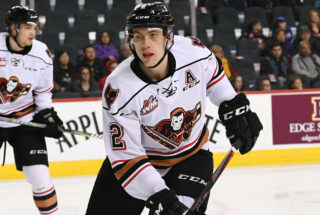 “I like to see myself as a leader on and off the ice and I think the coaches and staff saw that in the previous camps,” Prokop said. “Anyone could have worn the ‘A’ but I was so thankful that they put it on my jersey and I thought I did a good job helping be a leader on the team. To say that his rookie junior season has been a busy one is an understatement. From scoring his first career WHL goal to the national tournament, there’s been a lot to take in. 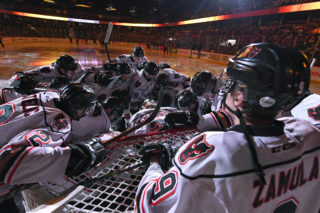 “It reminds me of my first year of bantam,” he said. “Everything is new and there are things that are coming at you so fast. I’m taking everything one step at a time and focusing on what’s ahead of me and not what’s in the past.